On the face of it, the premise seems ridiculous: Robin van Persie was undisputedly one of the best strikers in the world last year – this site named him Premier League player of the season in May – so, initially, Arsenal losing him and Man United gaining him is an immediate negative for the former and a positive for the latter. A more detailed examination reveals a different interpretation however. Cesc Fabregas’ move to Barcelona was far from surprising, dragging on for several years until he finally moved last year, but Samir Nasri’s transfer was less expected, and their only replacement was the last minute acquisition of Mikel Arteta – adequate but not equal. Arsenal looked in trouble, yet Van Persie saved them. For the first time in years, he was able to get through the season uninjured, so Arsenal didn’t lose their only real goal threat. Credit must go to Arsene Wenger for shifting him from a floating false nine-esque role to a more standard striking role, but equally credit must go to Van Persie for providing such a potent threat in what could have been a calamitous season for the North London side. What differentiates this year from the last is that Arsenal are fair better prepared for the loss of their star man. Supposedly Olivier Giroud was made aware that Arsenal would only make a move for him if Van Persie’s contract talks stalled, which, if true, shows Arsenal planned their pre-season brilliantly. Rather than continue to look for goals from one hugely talented player, Wenger has looked to spread responsibility with his additions. In Lukas Podolski he has a direct threat capable of playing on the wings – his lack of success at club level does raise question marks, but there’s little doubting his ability when he gets going; Giroud, although obviously a step down from Van Persie, is perfectly capable of replacing him as the man to lead the line; and Santi Cazorla, albeit overhyped by some, should fit in perfectly with Arsenal’s style, adding even more creativity to the team. Arsenal may have lost their star player, but, for all his talents, it’s not unfair to suggest Â£24 million for an injury-prone player heading into the final year of his contract and the twilight of his career is a good deal. The deal, however, is equally good for Man United. Â£24 million for one of the best strikers in the world isn’t a bad price – certainly good enough for Sir Alex Ferguson to break his recent pattern of only going for young players, which raises a different question: has Ferguson only bought Van Persie because of the value of the transfer? Breaking his apparent rules, the opportunity seems simply too good for Ferguson to pass up, which isn’t necessarily a good thing. Frankly, United don’t need Van Persie. He plays a similar role to Wayne Rooney, and in Danny Welbeck and Javier Hernandez, they have two capable young strikers who will more than likely have their growth stunted by having Van Persie playing instead of them. There’s the possibility he was bought to play in one of the wide areas of a 4-3-3, but that still doesn’t help matters when Ashley Young, Antonio Valencia and Nani are fighting it out for those spots too. Depending on the formation, United now have seven players fighting it out for a maximum of four spots. Their attack was the only area of the pitch that didn’t need improving – it was the four goals they conceded against Everton which gave the title to City rather than the lack of a fifth of their own. Â£24 million may be a better bang for their buck than the Â£15 million Everton are rumoured to want for Leighton Baines, but with Patrice Evra fading fast at left-back, it might have been the superior investment. Shinji Kagawa is a welcome and desperately-needed addition to the midfield, yet the return of Tom Cleverley creates another selection headache, with a Kagawa-Cleverley partnership too lightweight and most of the alternatives reaching retirement age. A 4-3-3 with Michael Carrick holding would seem the best bet, providing defensive stability and Carrick the energy around him he needs, but that means limiting the attacking slots further, leaving just three for the seven vying for them. 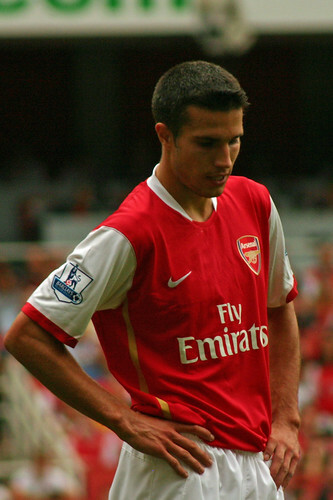 Van Persie, although a very good problem, builds on an already existing dilemma. Decisions, decisions. Ultimately, we will have to wait and see. Arsenal seem to have made the right moves in the transfer market, but there’s no guarantee those players will adapt and, even if they do, they still might not match the impressive scoring of Van Persie, despite being part of a more well-rounded unit. Meanwhile, Ferguson may have already plotted the perfect formula to deal with his selection woes. One thing’s for certain: on Â£225,000 a week, Robin van Persie benefits from his move regardless. Great article. I think the bigger loss would be song leaving, they have no one to replace him and would have to work quickly to buy another CM. Hopefully they can keep him, as they seem to have a good squad ready. Also it seems chamack might have a bigger role to play this season. Yeah you’re right, If United don’t buy a CM they will do badly in Europe again as they’ll struggle to control games. Chelsea will also have big problems if Lampard gets injured.